Rediscovering the driving experience with . 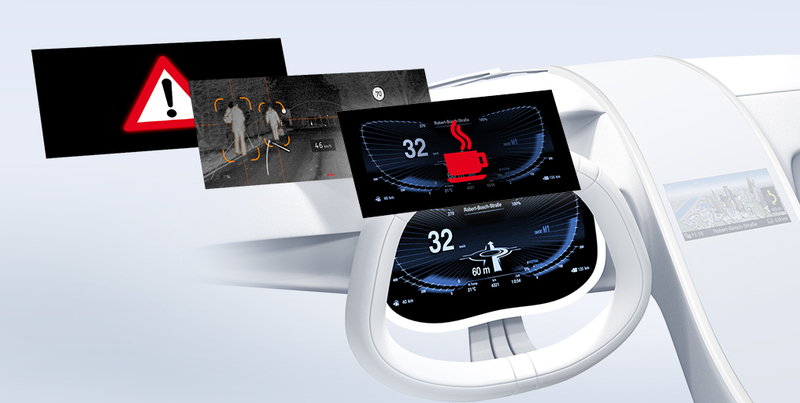 Smart command center: the driver controls car functions using voice commands and a touchscreen with haptic feedback. Artificial intelligence in the cockpit: HMI thinks ahead and prioritizes information in real time. A central cockpit computer controls the complete HMI. For years, touchscreens, handwriting recognition, and gesture control have been gradually replacing conventional mechanical buttons and switches in the car – to the detriment of road safety. After all, controlling the navigation system, the on-board computer menu, or the radio is a distraction. At CES 2018, in Las Vegas, Bosch is showcasing smart cockpit technology that lets drivers concentrate on driving. Eyes can be kept where they should be: on the road. “We are uncluttering the cockpit. The more complex the technology in modern vehicles, the simpler and more intuitive control systems need to be,” says Dr. Steffen Berns, the president of Bosch Car Multimedia. Artificial intelligence helps transform the human-machine interface (HMI) into a command center that thinks ahead. “Initial functionalities with artificial intelligence feed valuable information into the HMI about the driver, the vehicle, and the surroundings. That enables proactive adjustment of displays and controls to any given driving situation,” Berns says. Bosch also draws on this information for the development of automated driving. Here too, HMI is the core element that allows optimal interplay between people and vehicles. Artificial intelligence helps transform the human-machine interface (HMI) into a command center that thinks ahead. “Initial functionalities with artificial intelligence feed valuable information into the HMI about the driver, the vehicle, and the surroundings. That enables proactive adjustment of displays and controls to any given driving situation,” Berns says. Bosch also draws on this information for the development of automated driving. Here too, HMI is the core element that allows optimal interplay between people and vehicles. According to Allianz Center for Technology, 63 percent of drivers in Germany operate their navigation systems while driving, 61 percent switch through radio stations, and 43 percent browse through complicated menus on their on-board computers. Distractions like these are among the most frequent causes of accidents. “Our job is to make HMI a reliable companion in every situation,” Berns says. At the heart of the HMI is a voice-controlled assistant that responds to natural speech and can even understand dialects. Thanks to natural language understanding (NLU), drivers can talk to the assistant Casey as they would with a passenger. Another virtue of Casey is her ability to think ahead. Drawing on artificial intelligence, she can learn to predict likely destinations depending on the time of the day; or if she is asked to switch on the radio, she knows the driver’s preferences, such as listening to the news in the mornings and music in the evenings. We perceive 90 percent of our sensory input through our eyesight. That means that, as drivers, we have to have important information directly in our field of vision at the right time. Digital displays are taking over the cockpit. Today, this means more than simply keeping an eye on speed, rpm, and driving range. Smart algorithms capable of learning filter and prioritize content. If the roads are slippery, drivers immediately get a warning signal directly in their field of vision, while less important information, such as the current radio station, is switched to another display. That helps keep the driver concentrated on the road. 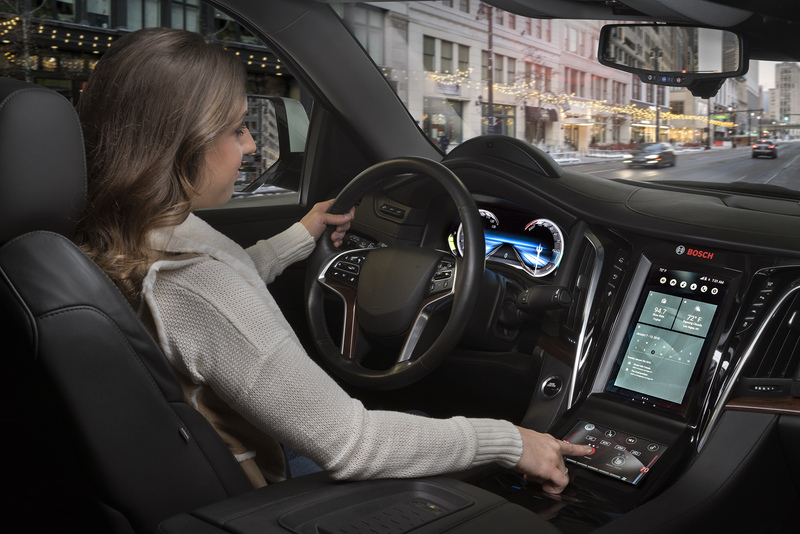 When it comes to operating infotainment, air conditioning, and radio, touchscreens and central controllers have a decisive drawback: the driver has to look to enter commands accurately. At a speed of 50 kph, the car will travel 30 meters while the driver’s eyes are taken off the road for two seconds; at 120 kph on the freeway, the distance increases to more than 60 meters – driving blind. “Car displays with haptic feedback are going to catch on. They allow easier operation of all manner of functionalities – for example radio and phone functions – faster, simpler, and, most importantly, safer,” Berns says. The keys displayed on the touchscreen feel just like real buttons. The haptic display thus conveys the feeling that the user is adjusting the volume using a real slide control. As a result, drivers can keep their eyes on the road for longer. Displays, infotainment, voice control: one consequence of the advanced cockpit technology is the increased demands on processing power, wiring, and the architecture of on-board networks. In current production vehicles, 5, 10, or as many as 15 electronic control units run displays and electronic devices. More processing power is needed to show coordinated information on all displays. In the future, Bosch will run the entire HMI through a cockpit computer and will integrate more functionalities in a single central processor. That will enable the convergence and synchronization of the infotainment system, the instrument cluster, and other displays so that any given information can be orchestrated, managed, and displayed anywhere in the vehicle at any given time. “It gives car drivers and passengers virtually unlimited possibilities for adjusting the air conditioning, controlling the navigation system, or changing radio stations, from anywhere in the vehicle,” Berns says. In addition, reducing the number of control units also frees up valuable installation space, lowers vehicle weight, and shortens the time needed for the development of new vehicles. And, in the future, over-the-air updates will ensure that the cockpit computer and hence the entire HMI is kept up to date with the same simple process used for smartphones.